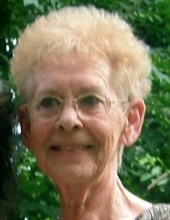 Eleanor Sue O'Grady Karcher, 72, of Marietta, OH passed away on Friday, March 22, 2019 at Arbors of Marietta. She was born on February 24, 1947 in Marietta to the late Russell and Audrey Marie Chaffins O'Grady. Eleanor graduated from Warren High School. She worked for many years at the O'Neill Center and later at Goodwill until her illness prevented her from doing so. She is survived by a daughter, Lisa Karcher Anderson and a son, Shawn Karcher, both of Marietta; three grandchildren, Brittany Karcher, Christopher Moss and Aden Karcher; three great grandchildren, Bradyn Goss, Graci Goss and Mia Martin; four siblings, Maryilyn O'Grady Chewning, William O'Grady, Dolores Johnson and Loretta Kuhn and numerous nieces, nephews and friends. In addition to her parents, she was preceded in death by two brothers, Earl and George O'Grady and a sister, Carol O'Grady Dickerson. In accordance with her wishes, cremation will be observed with a celebration of life to be held from 1-3 PM on Saturday, March 30, 2019 at the O'Neil Center, 333 4th St, Marietta, OH 45750. To send flowers or a remembrance gift to the family of Eleanor Sue Karcher, please visit our Tribute Store. "Email Address" would like to share the life celebration of Eleanor Sue Karcher. Click on the "link" to go to share a favorite memory or leave a condolence message for the family.